Sport England and the charity Sporting Equals have joined forces to launch an initiative billed as a catalyst for change for race equality in sport. The Manifesto for Change charter is designed to help tackle the barriers facing BAME communities in sport and physical activity. The charter calls on sport's governing bodies to capture data on ethnicity and to commit to tackling under-representation. Celebrating and promoting positive BAME role models is also a central theme of the programme. It comes as research published by Sporting Equals indicates 40 per cent of people from the BAME community have suffered negative experiences in the sport and leisure sector. 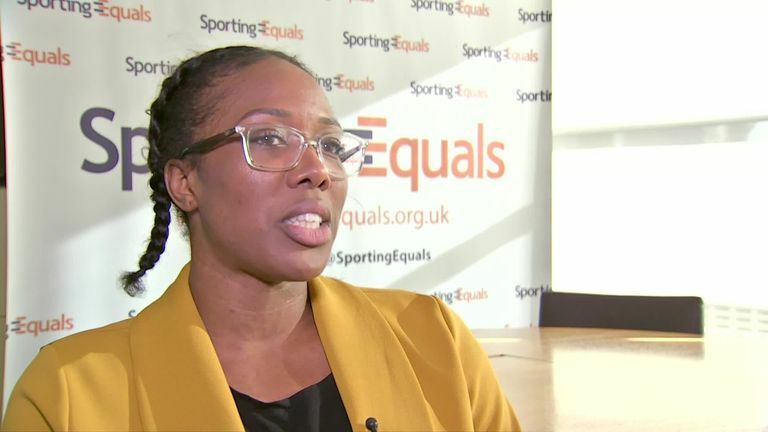 "That is a huge number," Sporting Equals chief executive Arun Kang told Sky Sports News. "And if they (people from BAME backgrounds) are having a negative experience they are not going to go the sports clubs, they are not going to get fit and they are not going to participate in sport. "That [in turn] affects [and gives rise to] ill-health." The Lawn Tennis Association are the first national governing body to sign up to the charter. The organisation's CEO, Scott Lloyd, says he is keen for his sport to lead the way in promoting ethnic diversity in sport. "We are really proud to be the first organisation to commit to this important charter," said Lloyd. "The LTA's new vision is to open up tennis to as many people and communities as possible, and I want tennis to lead the way in promoting ethnic diversity in sport. "We already work closely with Sporting Equals through our ground-breaking SERVES programme that takes tennis right to the heart of urban and disadvantaged communities, but we know we have more work to do. "Signing up to the charter is a real demonstration of our desire to take our plans to the next level and truly make tennis a sport for all."